Our residential courses usually run from Saturday to Wednesday (although this is flexible), with a maximum of 6 participants. Come on your own and make new friends, or organise a group of family or friends to come along together. 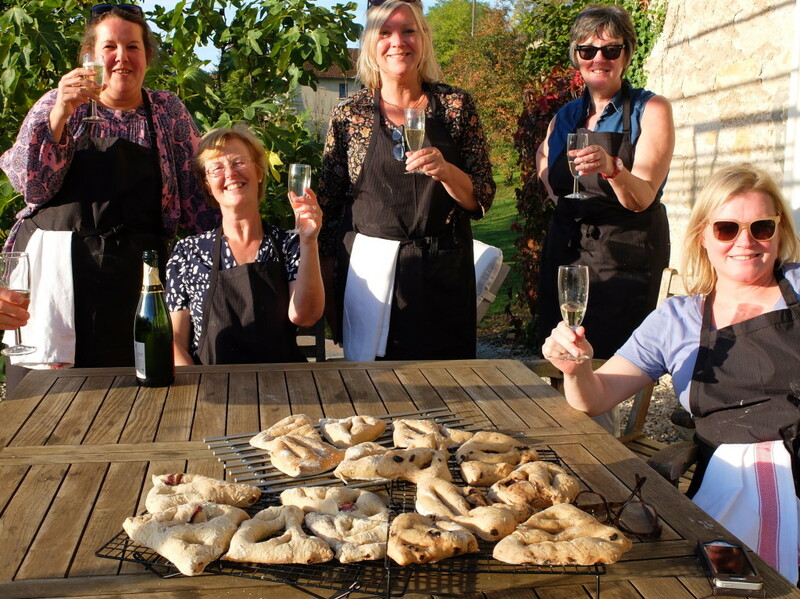 Our all-inclusive package includes flights from the UK (London Stansted to Brive), transfer from the airport, 4 nights accommodation (shared or sole occupancy rooms), cookery sessions with recipe cards and ingredients, all meals (with unlimited local wines) and excursions. There are 3 hands-on cookery sessions with the emphasis on learning new skills while having fun. You’ll cover some French classics as well as regional specialities, and make a variety of sweet and savoury dishes to enjoy eating every day. The programme is flexible – just let me know if there’s something you’d like to learn to cook and I’ll try to include it! The weekend also allows plenty of time to visit some of the beautiful nearby towns and villages, or to build up an appetite walking some of the local paths through stunning scenery. Sunday lunch in a renowned traditional local restaurant is an optional extra (approx €25 per person). For groups of 6 booking together, the timing and length of the course can be tailor-made to suit your group – just get in touch to discuss what you’d like. Morning flight to Brive. Marion will pick you up and drive you to Ambeyrac (90 mins) in time to settle into your rom and have lunch. Enjoy the first cookery session later that afternoon before drinks and a four course dinner. After a breakfast of fresh croissants and homemade jams, we’ll pick some ingredients from the vegetable garden ready for the morning cookery session focusing on local specialities such as ‘farçous’ (a type of savoury pancake), and using cheeses from the region. Then we’ll head out for lunch with Thierry, the enthusiastic owner of L’Auberge de la Grange du Cros, which serves wonderful food in a charming rustic setting. Our return drive takes us along the beautiful Lot River Valley, with optional stops at some of France’s most beautiful villages. Finish the day enjoying the results of your morning efforts for dinner. Monday morning’s cookery session will focus on desserts and baking skills, including a chance to make your own croissants. Enjoy a light lunch on the terrace, and in the afternoon put your feet up by the heated pool or build up an appetite for dinner on one of the many spectacular walks or bike rides on our doorstep. A four course meal with wine will be served in the evening. After a relaxed start, we’ll spend the day putting together an impressive dinner-party menu including canapés. Relax for a couple of hours before devouring the delicious results of your efforts in the evening. Transfer back to Brive after breakfast for your return flight.